When spring arrives it can mean only one thing…spring cleaning is just around the corner. I actually look forward to spring cleaning. I love getting into the cupboards, emptying everything out and giving everything a good scrub. It is also a great chance to take a close look at what is in the cupboards. You know, old coffee mugs, chipped wine glasses and dishes that you haven’t used in years. Sometimes I can feel a little nostalgic about dishes…am I the only one? We have a small copper pan that was my husband’s fathers. He used it to make omlettes. While I have never made an omlette in it in my life, somehow I feel a connection to this silly old pan. On the other hand, my other pots and pans are a mish-mash of overused and underwhelming equipment. So, when Canadian Tire sent me a brand new Lagostina Collectzione Pro 12 piece set to try out, I quite literally squealed with excitement. Canadian Tire has included the Lagostina Colleczione Pro in their Destination Home Guide, which lists an impressive collection of must-haves for Spring. So, I say out with the old and in with the new. Not only does the Lagostina Collezione Pro set include 4 pots (1.1 & 2.3 qt copper tri-clad, 1.7 & 3.2qt tri-ply clad) and a skillet (3.7qt bi-clad skillet with anodized exterior) it also includes a simply gorgeous 5qt enamelled cast-iron Dutch oven. Perhaps, what I was most excited about was the beautiful orange Dutch oven. I have always dreamed of owning a large Dutch oven. They are perfect for low and slow cooking. It really is quite impossible to braise meat without a Dutch oven. When I saw that was included in the set, I immediately started to think about what I wanted to cook. It might surprise you to learn that it is possible to bake in a Dutch oven. Many, many years ago I worked in a pioneer village and we cooked and baked over an open fire, using a Dutch oven. So, as I looked at this orange beauty I knew that I wanted to bake something that would celebrate spring…a rhubarb upside down cake. 1. Combine the rhubarb, sugar and lemon zest in the dutch oven and place over medium heat…cook until the rhubarb begins to soften…then turn the heat off and set aside. 1. Sift together flour, baking powder, salt and sugar in a large bowl. 2. 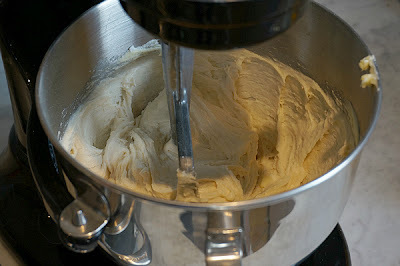 Combine butter, milk, vanilla and eggs in a small bowl…add to dry ingredients. 3. Beat together until batter is light and fluffy…about 2 minutes. 1. Pour the cake batter directly into the dutch oven, covering the rhubarb. 2. Put the lid on the dutch oven and place inside preheated oven for 35-40 minutes. 3. Test for doneness with a long wooden skewer, when the skewer comes out clean, remove from the oven. 4. To serve…Scoop out and flip slices onto a plate to. The rhubarb will be on the top. This method of baking resulted in a lovely fluffy and moist cake. The cake is easily removed from the Dutch oven thanks to its enamelled interior. We served this cake after a dinner of seared pork chops, pickled carrots and creamy pasta. I think we used almost every pot in the collection preparing the one single meal. Each pot worked amazingly well. 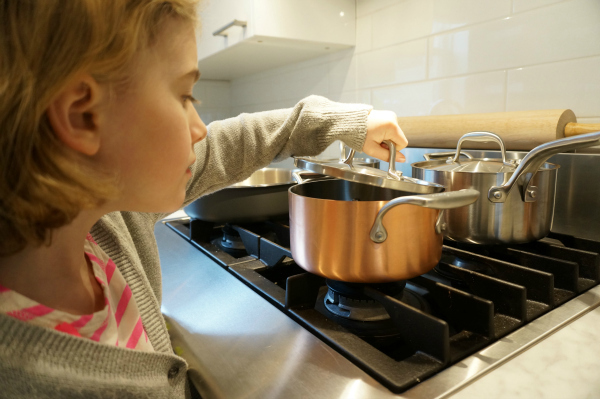 The pasta water came to a boil quickly due to the tri-ply cladding, which results in the heat being evenly distributed. All in all, we love our new pots, pans and Dutch oven. We have passed on our old pots and are happily embracing our new ones. 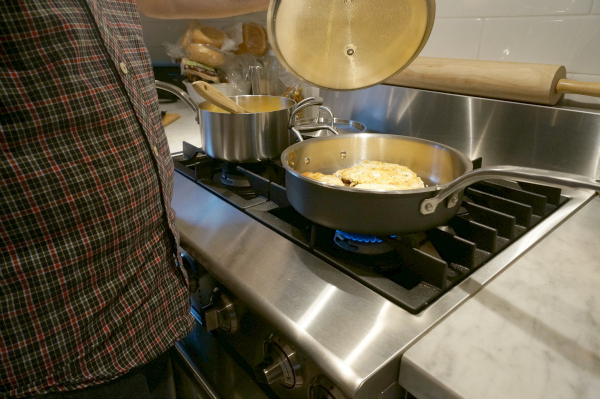 Of course, we held onto my father-in-laws pan…the memories it holds are priceless. However, we are looking forward to making many new memories with our new pots and pans. Wondering what the other essential items for Spring are? Check out Canadian Tire’s Destination Home Guide to find out how Canadian Tire can help you get ready for spring. This post was generously sponsored by Canadian Tire, but the opinions and images are my own. 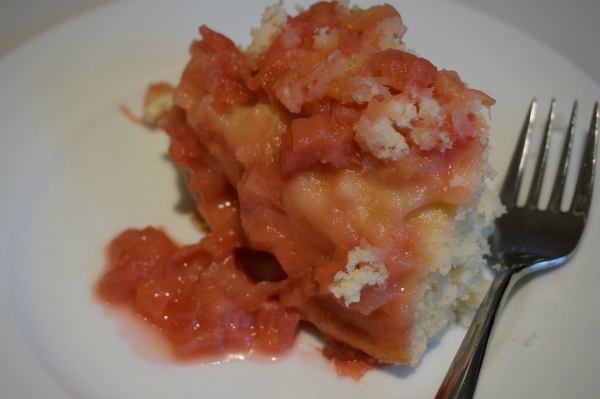 Oh your rhubarb upside down cake looks sooo good, thanks for the recipe! I have some Lagostina pots & pans too, they are so old but they still work just great – love them! Thanks Heather..it really is an easy and delicious cake! Thanks for stopping by. Yummy! My mom uses her dutch oven for a lot of recipes. She loves it. Those pots look amazing! And we need to try that recipe! I love rhubarb! And the pans = swoon! This looks good! I have a ridiculous amount of frozen rhubarb from my massive plant last summer, I will have to try. This post reminded me of just how old my pots and pans are. These new ones look amazing. Although I wouldn’t have immediately thought of Canadian Tire as a place to get them, I love the idea that I can! Especially when I’m there almost weekly getting other odds and ends for my house or kids (hockey tape anyone??). I’m always looking for new rhubarb recipes and this one looks really Yummy! Thanks for sharing with Simple Supper Tuesday! I love rhubarb and can’t wait to try this!